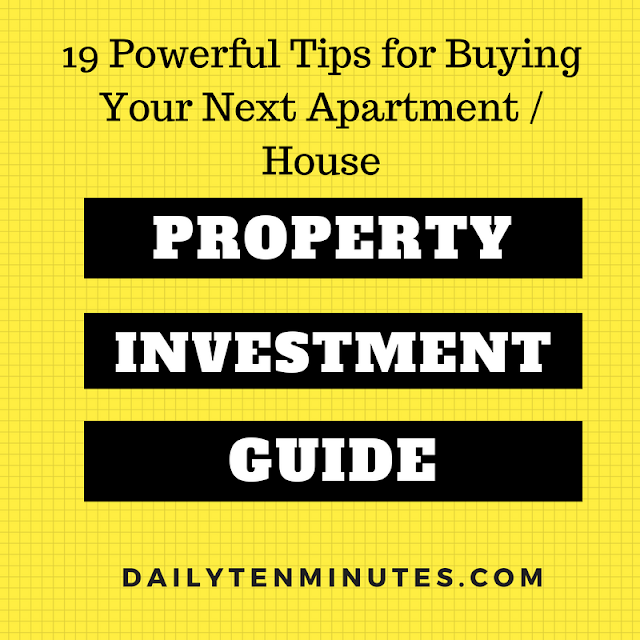 19 Recommendations for Property Investment - Do Not Purchase Any Property Until You Read This Property Investment Guide - Something New Everyday! Buying property is not something you do every month or every year hence being vigilant prior to making purchasing decision is very important. 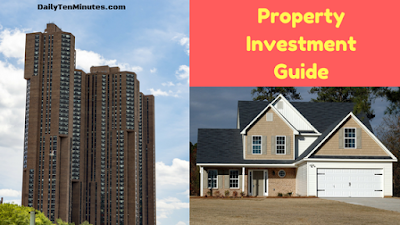 Whether you are considering an apartment for your own living or investing your money to make some passive rental income, a careful approach will lead to more satisfying experience and better value for money outcome. Thinking on the same lines, below Property Investment Guide has been prepared containing 19 aspects for your consideration. The foremost important question! Before making your mind for a specific property, check market price for similar properties from local agents (minimum 3) or respective market portal/website. Consider that fact that local agent and online property portals will quote the same price for the highly sophisticated/educated societies whereas for emerging countries or less-educated countries, asking price mentioned on website is usually 10-15% higher than the actual market price. Know the right numbers with thorough search. Remember, construction area and livable areas are different. Construction Area or Built-up Area (BUA) is actual used area of an apartment. Built up Area is the carpet area plus the thickness of outer walls and the balcony. Some apartments/houses might have large balconies which may not prefer specially for hot climate countries. Cost per square foot can give you a quick idea about your investment Vs Size. Posh areas would have higher cost per square foot. Most of the mature websites/portals usually show this value automatically. Check the cost per square feet value for similar apartments for quick comparison. If you are purchasing the unit/house for investment, remember the fact that your take-home income is after the payment of maintenance cost. Maintenance cost are usually calculated on per-square feet basis. In some buildings, maintenance cost is paid by tenant to the building management whereas for other countries, the owner is required to pay the maintenance charges (Monthly or Quarterly). Check who will be paying maintenance charges and how much. 5- Currently rented? If not, why not? Many investors prefer to purchase the unit/house which is already rented because they know how much they are going to earn out of it and also they want to start their income as soon as apartment is purchased. If the unit you plan to purchase is not rented, try to find out the reason. Probably, the building is not in-demand in the vicinity or tenants have more new buildings available in the community or the building has maintenance issues etc. Speak to the tenants and find out! 6- If Rented What is ROI? For example: you purchased an apartment in $600000 having annual maintenance cost of $10,000. If the annual rent is $50,000 then the ROI = (50000-10000)/600000 = 6.7%. Each property market has different ROIs. On a general note try to invest where ROI is 7% or more. Consider the most-likely nationality of the tenants of the area. European/American tenants usually prefer open kitchen setup whereas Asian wives mostly prefer closed kitchens to manage their large crockery. Since you want to be a good investor, always consider end-user perspective else not a lot of tenants would be interested taking your unit on rent. Most of the tenants would prefer the apartments with balcony for evening chit-chat, for drying their clothes or for simply placing kids cycle or other stuff. Depending upon the type of community (congested community vs wide area community or nice-view community) the size of the balcony also matters. If you are expat or investing in another country, always check the land/apartment ownership rules. In some countries the ownership is granted for 99 years from the date of construction. Although you are not going to live this much, but at the time of selling the unit, the new buyer might prefer buying free-hold property. None the less, 99-year lease will also be sold out sooner or later because human psychology is different for everyone! Always prefer to buy an apartment which was built by reliable builder. Check the reputation of the builder prior to making buying decision. Don’t just go for the outlook of the construction. All that glitters is not gold. It’s quite easy to make a poor-quality building look awesome. Beware of dodgy builders. Don’t get deceived. This article appeared on DailyTenMinutes.com originally. 11- Community Services at walking distance? Community services are very important aspect of any living. You don’t want to purchase a fantastic apartment with all the great feature but do not have schools, markets, parks, pray areas, banks and hospitals nearby. Such a waste of investment ! In-building features are equally important. Many tenants prefer to stay in buildings having gyms and sauna. If the family has kids, they will love having kids play area and pool. Also check the security features of building such as physical appearance of guard, wireless remote based car parking entry and CCTV in lobby, common area and parking. Check how many car parking are being provided. Are parking slot shaded/covered? You would not like to park your car outside the building which is prone to dust, sun and even stealing. Some architects consider providing built-in wardrobes. This is to facilitate the tenants to move to the apartment without much hassle of being new cupboards. This is definitely an ad-on you should consider. 15- Number of Washrooms? Extra Store Room? Maid Room? Extra rooms are definitely a plus however with large apartment space, the investment will also be higher. If you are buying for your own, do your need vs wants analysis and make decision based on your buying capacity. Sorry, I am writing this recommendation at number 16, whereas it should be one of the top considerations. Highly recommended to take your wife, daughter, mother to see the apartment because females have that strong critical aesthetic sense which males simply don’t possess. They will surprise you by looking into the nitty gritty of interior designing aspect. Personally I do not recommend mortgage approach. Firstly, you do not have clear understanding about your rate of return on investment since you have to pay monthly charges for many years of your life. Secondly, having a liability of returning massive amount of loan causes psychological pressure. I know many people who have lost their peace, got sick and deteriorated relationships due to loan stress. Think twice before you take any decision involving financial liabilities. Revenue which you could have earned if not invested in off-plan. Assurance from the builder on whether the forecasted completion date will be ensured. If not what compensation will be given to you? What are your rights as an investor and how the legal entity of land department is protecting you. Check the financial status of the building company. Seek guidance from local agents or real estate companies. What are the exact deliverables of the off-plan property (furniture details, tiles finishing, paint type etc. Check all of the features which are mentioned in this article above. All deliverables should be written in the contract. I hope these points will help making your property purchasing decision easy. If you have any other recommendation for this guide, please do share. Thank you for writing this article, it was a very good read. Thank you for your valuable article. I shall appreciate if you could share the excel based Return On Investment ROI analysis file and excel based check list.